This slow cooker recipe makes one of the easy homemade apple butter I’ve ever tried. So delicious on waffles, muffins, french bread- a perfect gift idea. Inexpensive and easy to make and so delicious! 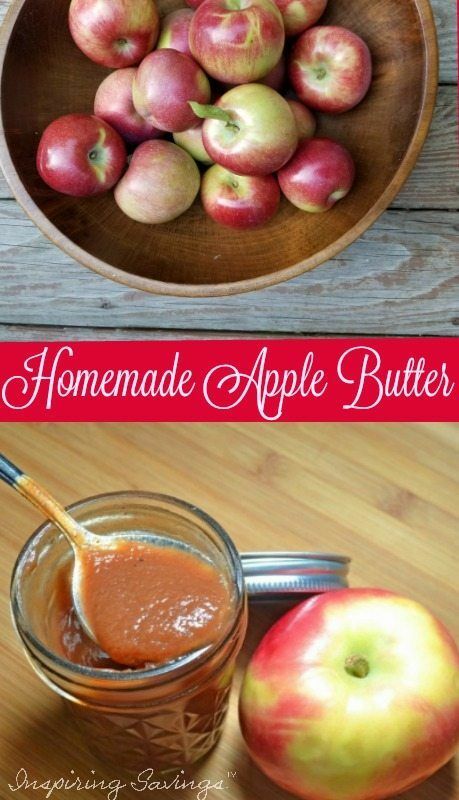 Apple butter is one of my favorite things to add to my morning toast or bagel. It is also autumn’s sweetest sensation, stealing the show as a condiment that can be used alone or in addition to your meal. My favorite fall time condiment goes great with my homemade pumpkin pie, pork chops, baked chicken and more. Your freshly picked apples are chopped up and slowly cooked in the crockpot with sugar and spices. Then they become this beautiful caramelized sweet thick dark apple butter. Making slow cooker apple butter is a great way of preserving apples, using the canning method. It’s hard to find good apple butter in the grocery stores, especially one which has no added preservatives or artificial additives, so homemade is the way to go for a great tasting and nutritious apple butter. This recipe is very simple and easy to follow. The hardest part is peeling those apples. But thanks to this apple peeler and my slow cooker it went a lot smoother. This peeler allowed me to peel, core, and slice 7 pounds of apples in a matter of minutes. Simply toss everything into the slow cooker, set the timer for 10 hours and went about my day. VIOLA! (but see my note below). You will want to take sneak peaks throughout the day. Just a note: If you are not preserving your apple butter by canning method (Please follower your pressure cooker instructions or Ball Canning book) then refrigeration is the next best thing. Your apple butter will keep for a month or longer your refrigerator. In my experience, this easy homemade apple butter is not a precise science. It is one of those things you have to check on every so often. Make sure the apples are not watery or for that matter to watery. Too much water will lead you to make applesauce. Continue cooking down until you notice a nice concentrated thick spread (like a good jam). Peel, core, and dice all the apples into cubes then combined with the brown sugar, granulated sugar, cinnamon, nutmeg, apple cider, cloves, and salt in a bowl until well combined. Place all combined ingredients into your crock pot on the low setting for 10 hours, stirring it every couple of hours or so and break up large chunks as it cooks. Once you have reached ten hours add in your vanilla and continue to cook for an additional 2 hours. If your apple butter is at your desired thickness use your immersion blender to puree it until it’s completely smooth and lump free. After it’s cooled, place it into containers that can be stored into the refrigerator or freezer. I like to use a blend of sweet & tart apples such as honey crisp, empire or any in-season apple for that matter. And there you have it – Easy Homemade Apple Butter.